Join us for an exclusive language training session with HR and L&D professionals from all over the world. Practice your Business English skills and learn more about The 70:20:10 Model at the same time. Learn the specific terms and buzz words that will help you interact with your international peers every day. 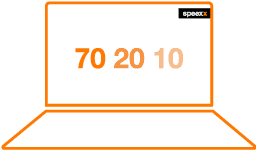 Brush up your English in an exclusive webinar all about The 70:20:10 Model in just 45 minutes. And it is absolutely free, no obligations.